It’s been a while since my last post. Please allow me to explain. Being a Hornets fan is really hard. I spent the latter weeks of the regular season clinging onto the slim hope that the Hornets could get the 8-seed in the East. And then on March 8th, they lost to the vastly inferior Brooklyn Nets by 14, and a few days later, they lost to the Knicks by 23. Neither game was as close as the score indicates. That is when I threw a white flag up on 2018. If you read any of my earlier posts, you know that I held two things to be true: 1) Steve Clifford’s time as an effective coach was over (though I knew he would be hired by the Magic, check that Twitter feed to the left! ), and 2) Dwight Howard was a black hole on offense. Both of these situations have now been remedied. By all accounts, an effective replacement for Clifford has been hired in James Borrego. And today’s trade (that will become official after July 6th) of Dwight Howard for Timofey Mozgov, two second round draft picks and cash concerns is a classic case of addition by subtraction. The Dwight Howard move was terrible. It was never going to work out. Every team he has ever played for claims that he is a cancer in the locker room. He is a notorious goofball. He is a child abuser, which was never going to fly longterm in Charlotte (this is the city that chased the original Hornets franchise out of town because the owner–George Shinn–had an affair with a cheerleader). He is a center in a league where the center position–as Dwight Howard plays it–is no longer important. Atlanta took on the terrible Plumlee contract just to get rid of him. I could go on and on. Timofey Mozgov may never play meaningful minutes for the Hornets. He may not even be on the roster by Friday. But if this trade results in Kemba Walker staying and/or the shooters on the team getting actual opportunities to shoot and develop a rhythm, this will go down as one of the most important trades in franchise history. In other news: Cody Zeller is destined to be a San Antonio Spur. Have you ever seen the sweet third passes that the CZA makes on the regular? Those passes have ‘Popovich’ written all over them. Sources say that Cody Zeller is the next Boris Diaw. Kawhi wants out of San Antonio. The Hornets are in a good spot to make a trade or be a third team facilitator for a draft day trade. My gut says these sources are correct. As for me, I’m in that pre-draft sweet spot as a fan. Anything is possible. Optimism reigns supreme. The Dwight trade has me jazzed. If the Hornets have to go down, I’d rather see them go down missing open threes and running an actual offense than see Kemba pass the ball in to Dwight and then stand around and watch until Dwight shoots just before the shot clock expires. But the Hornets don’t have to go down. The 8-seed is in sight. The time is now. Greetings, and welcome to my first post for Baseline Buzz! First, a brief history: I have been a Charlotte Basketball fan since 1988. My family owned season tickets during the franchise’s golden age (top row section 238, seats 1 and 2). I was at the playoff game when Zo hit the shot to beat the Celtics, and I was at every home playoff game in 2001 when the Bugs swept the Heat (and would have beaten the Bucks if Sam Cassell would have kept his glad-hands off the refs’ backsides). During the decade I lived in San Francisco, I bought NBA League Pass every year specifically for the purpose of watching every Bobcats game, and I was surely the only person to ever purchase a ticket to a game in Oracle Arena to cheer on Gerald Wallace. And no disrespect to Muggsy, Kendall, Johnny Newman, LJ and Zo, but I believe the greatest Hornets lineup of all-time was Baron Davis, David Wesley, Jamal Mashburn, PJ Brown and Elden Campbell (and the best bench player on that team was Eddie Robinson, for what it’s worth). With Adam’s departure from Baseline Buzz, I am stepping in midseason and attempting to fill some gigantic shoes. It is no simple task, to say the least. Rather than pick one thing to hone in on, I am going to about two bad things, two unknown quantities, and two good things. Without further ado. Look, I get it. Steve Clifford is an old-school coach, and making rookies earn their place in the Association is an old-school move. The problem is that the Hornets are not old-school good. I like Steve Clifford, and he is a much better coach than his predecessor. He seems like he would be a fun guy to have a beer with. But his propensity for driving rookies into the ground before they get their feet wet is one of his least endearing qualities. Malik Monk and Dwayne Bacon are both solid picks with gigantic potential upsides, but they need to play in order to develop into anything more than second or third-tier role players. Bacon is a solid second-rounder—if he develops into a solid NBA player, that is all gravy. But Monk needs to be in games early and often. He is a rhythm shooter, and you can’t develop rhythm on the bench. Give him meaningful minutes now, and he could be a star. Bench him so he can “learn the game” and he could be…. reverse-MKG? Unlike Adam, I hated the Dwight Howard trade from the beginning. The shedding of Plumlee’s contract was huge, and Howard’s star power is undeniable, but Dwight has a reputation of being a cancer in the locker room, and he is an admitted child-abuser. That being said, he is putting up All-Star numbers on the basketball court, he obviously cares about the team’s performance, and I get the sense that he is trying very hard to push his teammates into the playoffs. The problem is that he is a black hole on offense. 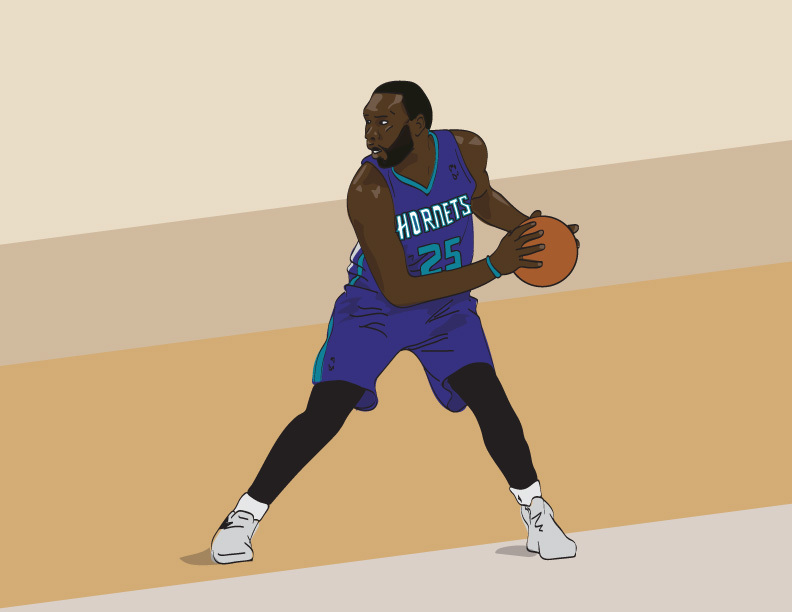 A large portion of the Hornets’ plays so far this season consist of Kemba (or MCW) bringing the ball up court, passing it to Dwight, and then dropping back and watching Dwight either shoot or pump fake until he gets fouled. In the past, the Hornets offense has worked with Cody Zeller at center because the CZA knows how to make the second, third and fourth pass to a cutting teammate or a shooter out on the perimeter. Of course Cody has been injured for a season and a half, so he hasn’t been an option of late. Look, Dwight Howard is very good at basketball. There is a solution out there, I am just not sure if that solution is to teach Dwight how to pass to his teammates or look to trade him to a contender who needs a center that doesn’t know how to pass to his teammates. Either way, he has been a disruption to offenses on both sides of the floor. Coach Clifford took a hiatus from the team for undisclosed health-related issues, and though Stephen Silas has a strong tie to Charlotte Basketball’s past (his father is former Hornets coach and current season ticket holder Paul “Huggy Bear” Silas), he doesn’t appear to be the answer should Clifford’s health or job performance become a longer term issue. Jason Kidd just became available. Just throwing that out there. Kemba has been a little stagnant of late. Maybe a trade rumor is the fire he needed to get going. An offer along the lines of Isaiah Thomas, Kevin Love and the Brooklyn pick or a package including Andrew Wiggins makes sense for both sides (Minnesota has always been high on Batum). There is a Berenstainian possibility that a trade of Kemba Walker could pull Steph Curry further towards the Hornets in the future. Reasoning: If Kemba does not get traded, he is all but guaranteed to pass Dell Curry as the leading scorer in Charlotte Basketball history. A trade to preserve Papa Curry’s legacy is sure to be looked upon favorably. I don’t believe the Hornets are willing to dismantle their franchise to save a few bucks so long as Jordan is at the helm. Jordan wants to win, even if he hasn’t figured out how to do so as an owner. The Hornets are terrible at drafting and even worse at developing rookies. Trading an All-Star caliber player for draft picks does not make sense for this franchise. Over the first half of the season, the Hornets had one of the toughest schedules in the league (anywhere from the toughest to the fifth toughest, depending on metrics used). For the remainder of the season, they have the easiest schedule in the league. Barring further injury or a dumb trade, the playoffs are still in reach (as of this writing, the Hornets stand four games back of the 76ers for the eighth seed). The advantage of developing an organization where you draft and retain players is that the players have the opportunity to learn together and grow together as professionals. Kemba Walker, Michael Kidd-Gilchrest, Cody Zeller, Frank Kaminsky, Malik Monk and Dwayne Bacon have all spent the entirety of their careers as products of the same developmental system. They don’t know anything different than Charlotte Basketball. Injuries to MKG and Zeller have derailed several potentially prime years, but they still know how to contribute if they are able, and everyone mentioned above is still very young. And speaking of oft-injured players, Nic Batum isn’t a native Hornet, but he has recently built a house in Charlotte, so one can imagine that he has bought into the organization as much as he possibly can. If Dwight Howard and Michael Carter-Williams are able to become more comfortable with their teammates, good basketball could be over the horizon. Nearly seven months ago I predicted the Hornets would win 44 games and finish sixth in the East. Most called this prediction overly optimistic and a few called it naive. In the end, Charlotte surprised us all by totaling 48 victories, finishing just a game out of the third seed despite a myriad of injuries to key players and a drastic change in their style of play. It was without question the most successful post-relocation season in Charlotte NBA history. Now it’s up to Rich Cho and the team’s front office to continue this success and propel the team to the next level. 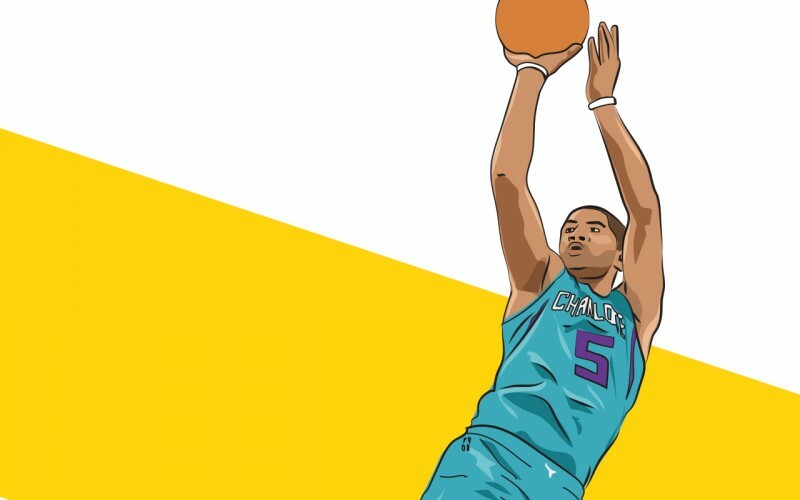 When Charlotte traded for Nic last summer, there was no question about the player’s talent or fit; it was Batum’s impending unrestricted free agency status that loomed over the entire season. Credit the Hornets for making his return feel more inevitable than it should and Nic’s postgame remarks after Game 7 sounded like a guy who plans on being back. The hope is that both sides have something on the table the minute free agency kicks off in July. They’ll need to make it quick. Why? He’s one of the team’s top three players along with MKG and Kemba Walker and his abilities as a point forward are a perfect fit alongside them. His near $20 million cap hold needs to be addressed before the team explores alternative options. For those unfamiliar with cap holds, unrestricted free agents count against a team’s cap sheet until they either sign with another team or are renounced by their current one. Batum will turn 28 next December and is in the beginning of his prime. Inking a deal that pays him near max money into his early 30s does make sense from the player’s perspective, especially a wing. Alternatively, Nic could gamble on himself with a short term deal or a player option after two seasons but as we saw last offseason, even with new CBA cash around the corner, players are much more likely to take the safe money – especially if it’s in the vicinity of $20m per. Ultimately, Nic seems happy in Charlotte and comfortable with the coaching staff, front office and ownership. Expect His Airness to pony up with the largest contract ever signed on his watch as an owner: 5 years, $100 million with a player option in the 5th year. Little Ayden Richard Batum will be living that bon vivant 4LIFE. Jefferson finished the season in a quintessential Big Al sorta way. He shot 50% against Miami and manufactured offense when the Hornets couldn’t buy a bucket. But he was also in less than great shape and contributed to Charlotte’s atrocious postseason paint defense. Coach Clifford received a blessing in disguise when Jefferson went down with an injury slash suspension midseason, discovering that a Cody Zeller/Marvin Williams frontcourt (especially when combined with MKG at the three) was much more effective at both ends of the floor. Big Al turns 32 next January and his inability to get into or stay in shape does not bode well for his future play. Renouncing his rights frees up a valuable $20 million in cap space for Charlotte to use on Jeremy Lin (player option) or Courtney Lee (updated, see below) both of whom will need to be re-signed via cap space (no Bird Rights). 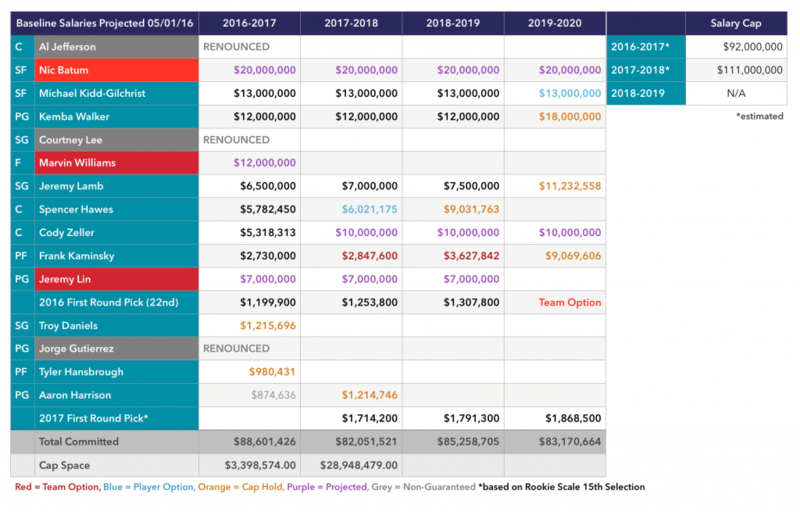 The Hornets could also use the $20 million in conjunction with another move (salary dumping Spencer Hawes and/or Jeremy Lamb) to bring in Dwight Howard. Either way, I fully expect Jefferson to be playing elsewhere next season. Thanks for the memories Big Al. We’ll always have the 2013-2014 Bobcats season. Of the three key secondary free agents (Williams, Lee, Lin), only Marvin ($9.1m cap hold) can be re-signed over the cap. Technically Lin isn’t a free agent yet but he’ll surely opt out of his $2.2 million player option in July; even so Jeremy’s cap hold will be less than $3 million so the Hornets will have some wiggle room to wait (if) they re-sign him. Lee’s cap hold ($10.8m) complicates things for his return and with MKG healthy and Jeremy Lamb being groomed for a larger role, he’s my bet for least likely to return of the three. Marvin will turn 30 in June and has logged a decent amount of miles. The elbow injury prior to the Miami series explains his disappearance on the offensive end. He was a key cog all season for Charlotte and a fantastic fit when Clifford goes small at the five with either Zeller or Kaminsky. I could see the Hornets offering a one-year $12 million deal and Marv taking it. Why that much and why one year? More on this later. Lin is the most interesting of the three in many ways. He’s clearly found a home with Clifford as a third guard. MJ loves him and Lin’s off the court ability to attract East Asian/Asian-American interest in the team can’t be denied. Given his consistent struggles with turnovers and his jumper (one of which did improve this season) I would be surprised if another team were to offer him their starting gig. Something in the neighborhood of 3 years, $21 million seems about right for J-Lin. He’ll get consistent minutes and a positive environment to showcase his talents. Consider him Kirk Hinrich in teal (or a more likable Ramon Sessions). Cody enters the final year of his rookie deal next season that will pay him a little north of $5 million. The following season he’s scheduled to count over $13m via cap hold. Cho won’t let it come to that. Charlotte has extended their Lottery picks in back to back seasons (Kemba, MKG) and I fully expect them to do the same with Zeller this summer. Fortunately Cody is still under the radar enough that Cho can likely get a deal done, even in the current cap environment, for something less than his on-coming cap hold. Again, just like Marvin, this is important and I’ll cover it more below. Something like 4 years, $40 million makes sense for a skilled, mobile seven footer like Zeller. Troy Daniels, Tyler Hansbrough, Jorge Gutierrez are unrestricted free agents. Daniels is the most valuable and is likely to be retained if the numbers are right but don’t expect Charlotte to break the bank if another team shocks him with real money. Aaron Harrison has a league minimum non-guaranteed option that could be picked up if the Hornets like his progress. Exhaustion plagued Kemba in the Playoffs; if Harrison isn’t ready to play, expect the Hornets to pursue a veteran 3rd PG later in free agency. Charlotte owns the 22nd pick in the Draft and could find a developmental big man or rotation player late. The Hornets traded their 2nd Round pick to Oklahoma City as part of the Jeremy Lamb deal. PREDICTION: Charlotte supplements their core with a third PG and backup Center. Make no mistake, the Hornets will compete in 2016-2017. With a (fingers crossed) healthy MKG, Kemba and Batum and one of the league’s best coaches and GMs – Charlotte has assembled a solid foundation on which to build. Next season should be about building on the previous one, trying to earn homecourt and win a round in the Playoffs; then pushing the momentum forward towards the summer of 2017. Why? Because (if you buy my predictions above) the Hornets will have all of their key guys under contract that summer with an additional $26 million in free cap space. If they can prove to a key All-Star free agent that they’re only one player away after next season, they have a shot of luring a top tier guy to the Queen City. Then the fun really starts. 1. The season is just hours away. We’ve been through the Draft hype, the Free Agency hype and now the Preseason hype. What are you most excited to see from these neo-Hornets? Bradford: Without question it’s MKG for me. I expect incremental improvement from his jump shot and think it’s still a couple years away from being a reliable weapon. But anyone who has seen the preseason has noticed the aggressiveness that has come with his newfound confidence on offense. I think the improvement everyone expected from year 1 to year 2 is going to manifest itself in year 3. I’m probably too old to be buying jerseys, but I might need an MKG jersey. Dr.E: Two things: A) MKG taking a step forward to become a more confident offensive player and B) How Lance Stephenson fits in. From a strictly basketball point, some of Hendo’s minutes going to Lance should be a good thing — all those fadeaway long twos Hendo had to take at the end of the shot clock when the first option on offense had been stifled? Many of those are going to be Lance drives to the basket now. But the chemistry thing is what I’m more interested to see — I still worry that Lance was a big part of the Pacers undoing last year. ASChin: The Cho Show. It was the least hyped event of the Hornets offseason yet MJ’s decision to dump Rod Higgins in order to let Rich Cho run the basketball side solo could turn out to be the organization’s best move. Higgins track record was horrendous and while Cho hasn’t been perfect (drafting Biz over Klay/Kawhi/Faried/Vucevic), he’s been way more successful and consistent in his transactions than Cory’s father ever was. Hornets fans haven’t had a legit GM running the show since Bob Bass skipped town over a decade ago. This could be the start of something good. 2. The Hornets starting PF at the end of the year is…? Bradford: Marvin Williams will start, but Cody Zeller will be a better player and have the better year. Vonleh will barely see the court. I love Cody’s playmaking in the preseason. He’s driving and kicking to the plethora of shooters in the second unit. Williams has the better shooting range, which the starters desperately need. Dr.E: I’ll go chalk here and say Marvin Williams. I know he’s had a quiet preseason, but he’s a reliable vet who’s learning a new system — he’ll be fine. ASChin: I’m gonna go out on a limb and say that Charlotte is the only team in the league that has a ‘Cody’ backing up a ‘Marvin’. Also, I’m gonna go out on a longer limb and say that Cody is the starter by Playoff time. The mid-range release has looked faster during the preseason and he looks more confident shooting it. Zeller’s playmaking isn’t as flashy as McRoberts’ but that doesn’t mean it can’t be as effective. Cody makes smart basketball plays and goes hard for contested boards. He looks stronger too. A little bit more consistency and he might be too good to keep on the pine. 3. True or False: Rich Cho purposefully timed Lance’s final year (team option) with Gordon Hayward’s player option. Bradford: True. But mostly for fun. Utah’s cap sheet is going to get interesting quickly having made so many draft picks so quickly. And if you’ve been watching Hayward whipping cross-court passes out of the pick-and-roll you can see what Cho liked. It’s pretty interesting that he was able to get such a team friendly deal with Stephenson. I can’t be the only one who thought, “They meant player option, right?” when I saw the headline. Dr.E: I think it’s safe to say that both sides (Lance and the Hornets) wanted the contract to be on the short side. Lance knew he cost himself some money with his antics last season, and wanted to bet on himself with a shorter contract that expires when the salary cap will be significantly higher. The Hornets want future flexibility in general, as much for Steph Curry as Gordon Hayward probably. ASChin: True. As the Baseline’s resident conspiracy theorist, I’m gonna say that Cho knew exactly what sort of deal Lance would agree to and poison-pilled Hayward’s contract in advance to give them another playmaking wing option should Stephenson bolt in a few seasons. The team made a HUGE impression on Gordon apparently – sending a crack team of investigators to uncover Hayward’s favorite refined sugar product and real-time strategy game. Don’t be shocked if Gordon’s wearing teal next to Steph Cur- *COUGH* Kemba Walker in a few years. Bradford: 12 points, 6 rebounds, 1 assist, 1 steal, 1 block in 28 minutes per game. I think MKG plays closer to 30 minutes this year and all non-scoring stats increase proportionately. For scoring I used his pre-season usage rate and multiplied that by small increases in shooting and free-throw percentages. These numbers may seem modest considering my previously stated expectations, but the increased usage and efficiency are big deals in my mind despite the raw numbers not being overwhelming. Dr.E: 11ppg, 7rpg, and a 15.0 PER in 27 minutes/game. ASChin: Dr.E and I can’t compete with Bradford’s understanding of math. 12.5ppg, 7rpg, 1apg, 1.5spg, 1bpg AKA “The Young Gerald Wallace” line. 5. Most likely Hornet to be traded before the Deadline is…? Bradford: Henderson is the easy answer. I’m going with Bismack Bye-ombo (see what I did there?). I’ve been really loyal to Biz, all the way up until the preseason where it’s just been the same old things. A good rim protector who struggles with defensive positioning beyond standing at the rim and waiting, with nothing to bring to the table offensively. You can’t even throw lobs or hit him as a roll-man let alone post him up. I could go out on a real limb and say PJ Hairston is going to come on strong and Biz will be packaged with Gary Neal at the deadline to fill out a contender’s roster, or Sacramento’s overly exuberant ownership. Dr.E: It’s less likely now with Jeff Taylor no longer around, but I’ll still say Gerald Henderson. Dark horse would be Cody Zeller or Noah Vonleh if some big trade became available. ASChin: Trader Cho has lots to work with heading into the Deadline. IF the team believes that both Cody and Vonleh are and always will be power forwards then one has to go, right? Before Taylor’s meltdown, I swore Hendo was the odd man out. Now the team desperately needs another athletic wing who can defend off the pine. Biz isn’t worth anything close to his upcoming qualifying offer or cap hold but he’s worth more to Charlotte now as a backup big than the 2nd Round pick he’d return. I’m going with Gary Neal. 6. Will Al Jefferson finally make the All-Star team? Bradford: Sadly, no. I think you’ll see some combination of Bosh/Noah/Horford. If he does it will be due to Noah’s foot or Horford’s pectoral muscle. Dr.E: As long as he doesn’t have a slow start, yes. ASChin: If Charlotte is over .500 by the time the coaches vote, they’ll have to send a representative. YES. 7. The biggest dropoff from last season will be…? Bradford: This one is pretty obvious when you think about it. It’s protecting the ball. Charlotte’s turnover ratio was tops in the league last season by a healthy margin. Lance Stephenson had a higher turnover ratio than anybody on the team last year. Dr.E: I’m a little worried about regression for Big Al. 8. The biggest improvement from last season will be…? Bradford: Shooting, shooting, shooting. All credit to CDR and Anthony Tolliver for their efforts last year, but a full season of Gary Neal, Brian Roberts, PJ Hairston, Marvin Williams, Lance Stephenson… They shouldn’t be 23rd in 3 point percentage next year. 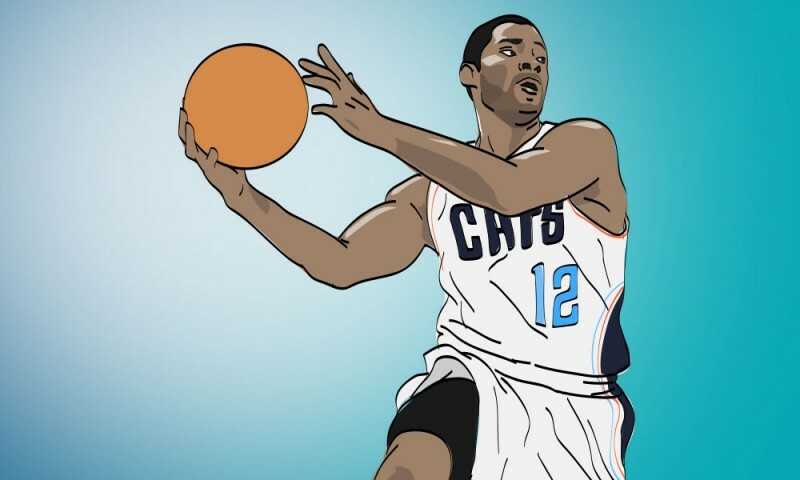 Dr.E: Hoping it’s MKG, but seeming more likely it’s Gary Neal, with the weight loss in the offseason and a full preseason in Clifford’s system. ASChin: One more vote for shooting. The Bobcats were a very poor shooting team before the Break last season. Two of that team’s three point weapons, CDR (51) and McRoberts (105), DEMOLISHED their career highs in three pointers made – notching nearly two-thirds more makes than their cumulative previous career totals. Tolliver’s 105 makes will be missed but so many of his threes came in bunches early and he mostly sat once Douglas-Roberts proved a better defending option at SF. Marvin (84 threes in 66 games), Roberts (66), Lance (86), Neal and P.J. Hairston will more than make up for the departed. Each one of those guys has faster strokes and, outside of Lance, rarely hesitate to launch one. The big key to the Hornets becoming a very good shooting team is Kemba – he should get more spot up opportunities this year playing off of Lance. 9. Will Noah Vonleh log any meaningful minutes in his rookie season? Dr.E: Clifford has already pretty much said no for the first half of the season, and if the Hornets are in the thick of the playoff race, might not be many minutes in the second half either. ASChin: Not likely. I’ve been using Portland-era Jermaine O’Neal as a comp. He’ll sit as a youngster on a good team and learn valuable lessons behind vets who are trying to win now. 10. More likely to make an appearance at the TWC the season: Jeff Taylor or Rufus Lynx? Bradford: My first inclination is to say Rufus. But if Taylor was going to get cut, why wait? He’s nothing more than insurance on the wing with no real future with the franchise (sorry JT fans). The team has to know more about the situation than has been publicly released. I don’t know if we’ll see him get minutes in an actual game, but I think you’ll be able to catch him chilling on the bench at some point. ASChin: Rufus and his friends Primoz Brezec and Melvin Ely will crash the Hornets opener wearing black B.W.O. t-shirts. OHMYGAWD IT’S A BOBCATS WORLD ORDER!!! 11. Worst move of the offseason: Letting McRoberts walk for the mid-level OR Paying Marvin Williams $7 million per season? Bradford: I’m going to say Marvin Williams at $7 million fully guaranteed. Some sort of team option or partial guarantee on year 2 would have made sense with such a high number. It’s not a crippling move, but it’s not very flexible either. As for McRoberts, last year was a career year that I don’t think he’ll match again. It was a right place, right time kind of situation. The 3 point shooting probably won’t hold up. And even though he hit 3’s at a decent clip, teams still didn’t respect it according to SportsVU’s gravity measurements as discussed here (Insider Only). The more interesting angle on McRoberts is which decision was worse, Cho not re-signing him or McRoberts choosing to leave? Dr.E: Letting McRoberts walk for sure. If the Hornets don’t get off to a good start, it won’t be the end of the world, but it will be because McBob isn’t on the floor holding things together. ASChin: McRoberts was set to become this generation’s Gminski, a bearded Dookie who played the game the only way a six-ten Jesus could: with style and grace; turning Lebron’s other cheek into his other elbow. Why Cho? WHY???!!! 12. The Hornets finish the season with a record of…? Bradford: I’m sticking with my non-stats based 45-37 prediction from the summer. ASChin: 50-32. The first time a Charlotte NBA team has notched fifty since 1998. 13. True or False: The Hornets will win a Playoff game this season. Bradford: True. Not only will they win a playoff game this season, they’ll win a playoff series. ASChin: They’ll get to the Mike Woodson Invitational AKA The Second Round. 14. What does Kemba’s contract extension look like? Bradford: 4 years, $50 million with a player option on the fourth year. Dr.E: It’s really hard to say without knowing more details about how and how much the salary cap is going to go up over the next few years right? I guess in the 10-11 million per range? ASChin: Cap uncertainty is a major issue but Cho’s greatest strength has been contract negotiation. I’m gonna say it’s 4yrs, $48m with a team option after year three – timing it perfectly with a famous Charlottean’s free agency. 15. Unsung Hero: Which under the radar Hornet makes the biggest contribution this season? Bradford: As a bit of a fanboy I want to say Brian Roberts, and I love his signing, but I’m going to go with Gerald Henderson. He’s the forgotten man and there are legitimate concerns about his fit with the team going forward. But I think he becomes an essential glue guy. He’s been overextended since he escaped the shackles of Larry Brown. He never should have been a first, second, or even third option on offense. He has an opportunity to redefine his career as a spot-up shooter and cutter who never handles the ball and puts most of his energy into defense. You know who else couldn’t shoot for the life of him until all he had to do was stand there, catch, and shoot? Thabo Sefalosha. Steve Clifford loves defensive versatility and Hendo is strong enough and athletic enough to defend multiple positions. An obvious trade target, and I’m not saying he won’t be, but Hendo is going to play a big role on this team. It’s all up to him to take on this new challenge and I think he’ll have a great year. ASChin: Tyrus Thomas. MJ is gonna cringe every time he sends out a cut of the $9 million amnesty the team still owes T-Time. Every time Dougie McBuckets nails a three (Chicago acquired McDermott by packaging the Bobcats first rounder from the Thomas trade), MJ is going to curse the names of Larry Brown and Rod Higgins. The Tyrus and Tyson Chandler deals cemented Jordan’s status as a poor basketball mind five years ago. He’ll use these memories like he used getting cut from his high school basketball team. As the Waterboy would say, “Tacklin’ Fuel”. The Hornets will win a title in the next decade. Kemba shoots 45% from the field. Cody Zeller averages 3+ assists per game. PJ Hairston scores 30 in a game at some point. Charlotte ranks in the top half of the league in attendance. Lance Stephenson has less than 10 technical fouls all season.